The Arroyo Grande Police Department is actively recruiting students between the ages of 14 and 21 for their Police Explorer Program. 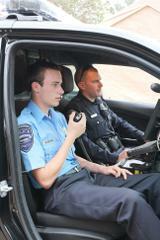 The Explorer Program is designed to encourage participants to plan for a career in Law Enforcement or Criminal Justice. Participants will develop insight into how police officers and police personnel perform their daily duties. Activities Include: Attending Monthly Meetings, Annual Explorer Competitions, Crime Scene Assistance, DUI Checkpoints, Event Security, Outdoor Activities, Physical Training (PT), Traffic Control, Ride-Alongs, and Specialized Law Enforcement Training. Police Explorers meet twice a month on the second and fourth Tuesday from 6pm-8pm at the Arroyo Grande Police Department. If you are interested in joining our team, please go to www.arroyogrande.org and under the “government” tab at the top click on “police”. Then under the “divisions” tab click on “Explorer Post 542”. You will be directed to a page where you can create an account and apply. Once you apply an Explorer Advisor will contact you!